Interestingly, anybody can start information marketing business and grow it to any level. You need not to be an EXPERT, all you need is the Know-How. Information marketing is simply selling information products that solves a particular problem or provide information to people. These information products can be in the form of ebooks (PDF) which is the popular one, it can in the form of video tutorial, it can be in the form of audio book or podcast, it can be in the form of apps, it can also be in the form of softwares. It all began in June 2015. On that day I was browsing through Nairaland Forum when I noticed a particular thread in which the poster explained how to start a mini importation business. I was amazed at the massive number of views that the thread attracted within a few days (over 7,000). And from that, I quickly deduced that a lot of people were very much interested in starting their own mini importation business. To confirm that, I headed for the Business section to dig out past threads on the same topic. They all attracted massive number of views. So, my deduction was right, after all. At the end of the digging task, I drew my conclusion — that many people would readily pay to get good information & guide on Mini Importation. And that was how I got inspired to craft my first ever premium information product. Gathering quality information was my greatest challenge back then. I had little knowledge and background on the business of Mini Importation. Yet, I was bent on creating an e-book on that topic. I would conduct in-depth research on my own to get quality information on the various stages of Mini Importation. So, I started writing the proposed e-book, covering the outlined topics one after the other and ensuring that each chapter contained all the necessary information. The whole writing process took me about three weeks. Having made the content as detailed and near-perfect as possible, I wrote the copyright, table of content, disclaimer, and about the author pages. Then I proceeded to the aesthetics aspect. Using Microsoft Word, I designed the pages and back cover for the e-book. (I later hired someone to create a better-looking e-cover for me, though). After making sure that everything is fine, I converted the e-book into Pdf, crafted a compelling sales page and got it ready for launch. Next, I promoted the e-book on Nairaland by placing paid ads in the Business section. I also promoted the e-book using Facebook Ads. Before the end of the month, that single eBook I wrote pulled in N200,000 naira in sales. Our economic climate is made up of the Producers and the Consumers. The Producers produce the products while the Consumers continuously PAY the producers. If you want to make money online, you need to start producing and selling your products. The Masters of the internet are those who have PRODUCTS to sell. On Saturday the 21st of April I'll for 4 hours empty my brain to all the participants of my first WhatsApp Webinar. 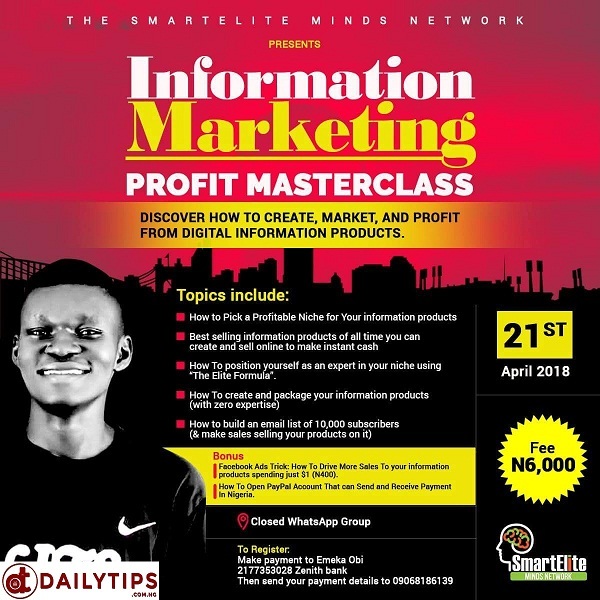 As a participant, you'll get to discover how to create, market and make profit selling digital information products. • How To position yourself as an expert in your niche using “The Elite Formula” – And Make People BEG to buy your products. • Facebook Ads Trick: How To Drive More Sales To your information products spending just $1 (N400). • How To Open PayPal Account That can Send and Receive Payment In Nigeria. This masterclass would be kept small because of the level of knowledge and information that will be shared. After payment, send your details such as: Account name and phone number to 09068186139. Once payment is confirmed, you'll receive a text from us and be automatically added to our group on Whatsapp. – I did it, YOU too can. If you have any questions you can ask in the comments section. 0 Response to "HOW I MADE OVER 200k MONTHLY SELLING VERY SIMPLE INFORMATION PRODUCTS ONLINE (& HOW YOU TOO CAN)"